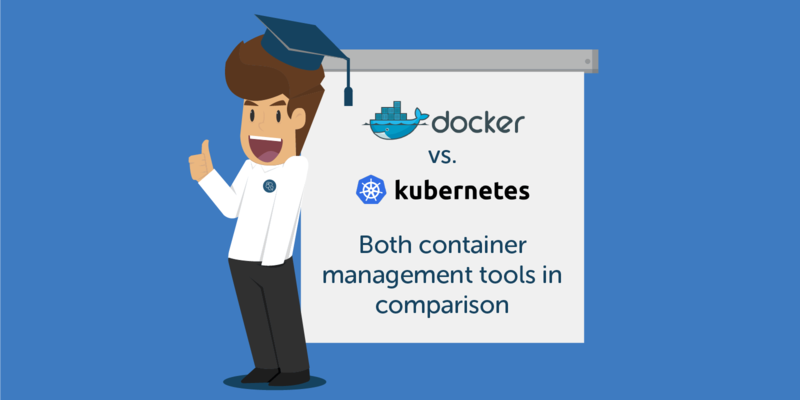 Im Durchschnitt wird dieses Tutorial Docker Swarm vs. Kubernetes: Comparison of both container management tools mit 5 bewertet, wobei 1.0 die schlechteste und 5.0 die beste Bewertung ist. Es haben insgesamt 1040 Besucher eine Bewertung abgegeben. When it comes to building a cloud-based infrastructure, containers and cluster solutions have been discussed so often recently. Kubernetes and Docker Swarm are the two most popular open source solutions, known in the field of container orchestration. But both tools have little in common, except that they both use Docker images. However, if you already have experience with Docker Swarm, you will find a lot of new things on Kubernetes and vice versa. That gives the question of which of the two tools is right for you even more importance. Here we introduce both tools briefly and explain the differences. But what is container orchestration again? Deploying the development environment using containers has meanwhile become standard. When you think of container orchestration, the simplified process is applied to virtually all systems in the data center or in the cloud. From a certain number of containers you need a tool for managing the containers. These tools each have their own methods for managing complex environments. An administrative component, such as The Swarm managers at Docker Swarm manage the visualizations at the network level. You do not have to worry about a dropping container or having to restart a container anymore. Therefore a complete tool set with features like “load balancing”, “container replication” or “scaling“ is available to you. What Docker is and how to install it on Ubuntu 16.04 LTS, you already learned in our Tutorial: “Docker auf Ubuntu 16.04 LTS – A simple Cooking Recipe”. If you’ve been working on Docker for a while now, you’ve probably come across the term Docker Swarm before. In short, Docker Swarm is a native microservice for container orchestration. The Swarm functionality is available in Docker as of version 1.12. You have to think of the Swarm as a composite of multiple Docker systems, such a compound unit is called a cluster. The systems within a cluster are called worker nodes. The administration of the individual clusters is carried out by the so-called swarm managers. A Docker host can act as a manager, worker or in both roles. A running container, which is located in a Swarm and managed is called Task. Kubernetes is the result of more than a decade of experience of Google with Linux containers. The internal cluster management system, Google was working on, was called Borg. Like Docker Swarm, Kubernetes solves the problem of efficient container orchestration, but pursues a more complicated approach. In order to understand the Kubernetes system, you have to know how the individual concepts are composed. A Kubernetes cluster consists of a master node and worker nodes. A master node can be thought of as a control center from which the containers are managed. In real systems, multiple masters are the rule. Communication with such a master takes place via a control layer via REST API with extensive functionalities. A master node consists of a number of other components such as etcd, controller manager, scheduler and Kubelet. Kubelet and etcd communicate directly with the API server. The etcd layer is a kind of database that stores the configurations of each cluster, and Kubelet is a management instance for the pods that run on the hosts. The scheduler ensures that your containers land on the right systems within a cluster, so it decides on the distribution of pods independently depending on the workload. The Controller Manager monitors and directs all processes that originate from the API and places workloads on the nodes. Got it? As you’ve probably already noticed, the concept is not explained so quickly, we still have a few points to go through. The worker component consists of: services, pods, labels, and replication controllers. Services: Services are a kind of connection to a group of containers. A service helps to keep the container structures simple and to build logical collections using the labels. Pods: The pods are an abstraction to aid container administration. Containers in a pod run on the same worker node and share resources such as file system, IP address, or kernel namespaces. Labels: Labels are user-specific attributes assigned to the pods, e.g. to search or update. Replication-Controller: The Replication Controller acts as the framework and is responsible for the pods. In the event that a container goes down, the replication controller will start a new pod with containers, and if the old one comes back, take it down accordingly. Kubernetes and Docker Swarm are both powerful tools for container orchestration and both provide a large community for learning and knowledge sharing. Since Docker Swarm acts as part of Docker, the Docker Command-line interface (Cli) with the well-known functions like Docker compose, is at your disposal. In Kubernetes you do not have a direct interface, you have to address everything via the internal API. Kubernetes is designed for scalability, availability and security. In addition, the reliability and flexibility of Kubernetes are important factors. Even if you did not plan to play around with Kubernetes, you will certainly benefit from the Kubernetes code. For example, GitHub uses Kubernetes to keep things running for you. Kubernetes also gives you maximum freedom in choosing your operating system. Both tools can easily be scaled to large setups, but in terms of complex applications on a large to a very large scale Kubernetes is way out in front of the other tools. The winner in a direct comparison really depends on what you prefer to work with and what kind of project it is. Docker Swarm convinces with its simplicity, as all docker components are native, but with Kubernetes the learning curve is much steeper. Therefore, both orchestration tools have their own advantages. If you do not have to scale very big and are looking for something that is easy to use, the choice is Swarm. But if you want to scale up, build thousands of servers, and build a new world-class service like GitHub? Then you should keep an eye on Kubernetes! Of course, there are other alternatives such as Apache Mesos or Rancher Cattle on which it is worth taking a look. Übrigens: kennst du schon unser Tutorial zum Thema Install Rancher v1.3 on Ubuntu 16.04?